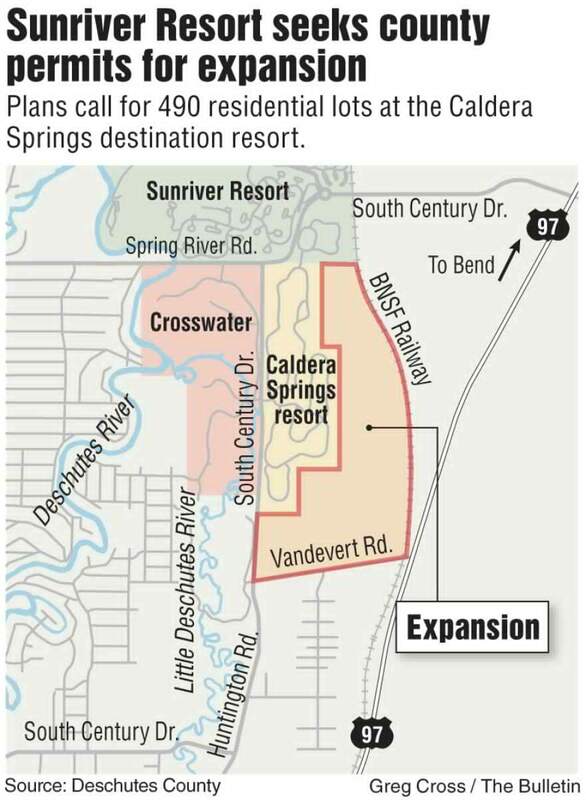 Deschutes County is reviewing a permit application for developing up to 395 residential lots as part of an expansion at the Caldera Springs destination resort. The project would allow for more than double the lots already located at the resort, which is south of Sunriver on South Century Drive. Most of the current lots have been developed with housing. Pine Forest Development LLC, a wing of Sunriver Resort Limited Partnership, the owners of Sunriver Resort, filed the permit application. A county hearings officer held a hearing Tuesday to take public comments about the permit application. About a dozen people attended. The developers are also requesting a ratio of 21/2 single-family homes to 1 overnight unit compared with the current 2 single-family homes to 1 overnight unit requirement. State law allows the increased ratio of homes to overnight rentals at destination resorts. The 614-acre property borders South Century Drive and Vandevert Road. The owners of surrounding properties have raised concerns about traffic impacts. The proposed development would have a new access point on Vandevert Road. The Vandevert Ranch Owners Association, a group of five ranchers with common land, expressed concern in a letter about the potential traffic from increased density in the area. A final transportation impact analysis report prepared by Kittelson & Associates Inc., a Bend engineering and planning firm, concluded that, if fully built, the development would generate 162 vehicle trips between 4 and 6 p.m. during the peak summer season. Peter Russell, senior transportation planner for the county, submitted a memorandum on the number of vehicle crashes along South Century Drive near the proposed development. Between 2009 and 2013, 21 crashes occurred and no fatal or serious injuries were reported, according to Russell. The 3-mile segment between Spring River and Huntington roads averaged 5.25 crashes a year, according to the crash data. The property is along a route for migrating deer during the winter, according to the Oregon Department of Fish and Wildlife. The area is within a wildlife zone that requires protection of deer habitat. The department recommended in a letter to the county in September that the developers keep a portion of undeveloped land for habitat in the east-west direction next to Vandevert Road. Alana Hughson, president and CEO of the Central Oregon Visitors Association, expressed support for the project in a letter to the county regarding the permit. Carol Macbeth, an attorney with Central Oregon LandWatch, said at the hearing that the expansion and current Caldera Springs resort don’t meet the definition of a destination resort under state law. Macbeth said the organization is also concerned about the evacuation route from the development if a wildfire breaks out.